Ayokunle Odeleye has been working as a professional sculptor and arts educator for the past thirty eight years. He received a Bachelors Degree in Art Education from Howard University in 1973 and a Masters Degree in sculpture from Howard University in 1975. He has taught art at Dunbar High School, The Duke Ellington School for the Arts and Howard University in Washington D.C., and at Woodland Middle School, Spelman College and Georgia State University in Atlanta. Currently he is a senior Professor of Art at Kennesaw State University in Kennesaw, Georgia where he has been teaching for the past twenty two years. He is the owner, primary designer and fabricator of Odeleye Sculpture Studios in Stone Mountain, Georgia. This studio specializes in the creation of large scale sculptures for public spaces in a variety of media. 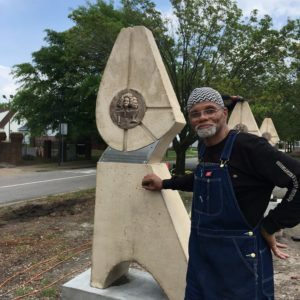 He has created sculptures for cities across the United States from Atlanta to Alaska, many of which have historic significance. The studio also creates finely crafted works of sculpture in a variety of hardwoods and mixed media. 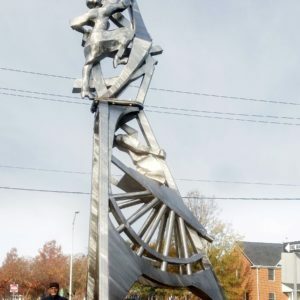 Ayokunle recently created a stainless steel and bronze sculpture for the City of Atlanta Office of Cultural Affairs, to be placed at the intersection of Cascade Rd. and Benjamin Mays Blvd. The sculpture which also functions as a working sundial and light fixture includes elements designed to honor significant individuals from the Cascade Road community who’s scholarship and creativity has impacted Atlanta and beyond. In July 0f 2011, Ayokunle received the prestigious Mid-Career Artist Award from The National Black Arts Festival in recognition of his 38 years as a professional artist and arts educator. In November of 2012 the Museum of Contemporary Art in Atlanta honored Ayokunle with a Retrospective Exhibition of drawings, photographs and models of his work highlighting 32 years of excellence in the field of Public Art.